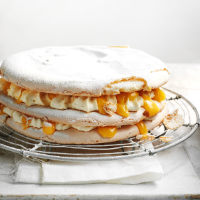 What’s not to like about a giant, three-tiered macaron filled with lemon curd and cream? 1. Preheat the oven to 150 ̊C, gas mark 2; set up 3 racks in the oven. Draw around a 20cm cake tin on 3 pieces of baking parchment; cut them out and place on 3 baking sheets (pen-side down). Pulse the icing sugar and almonds in a food processor until combined. Tip into a bowl and mix with 2 egg whites; set aside. 2. Warm the granulated sugar in a small, heavy-based saucepan with 3 tbsp water over a low-medium heat until the sugar dissolves. Increase the heat and boil until the syrup reaches 118 ̊C (soft-ball stage) on a sugar thermometer. Meanwhile, put the remaining 2 egg whites in a bowl and use electric beaters to whisk to soft peaks (or use a freestanding mixer). As soon as the sugar syrup reaches 118 ̊C, carefully and slowly pour it into the egg whites (try to avoid the beaters) and whisk to stiff peaks. 3. Add a spoonful of the meringue to the almond paste to loosen it, then fold in the rest. Divide the mixture among the circles on the baking trays, carefully pushing it to the edges to make 3 giant macaron discs. Leave to sit at room temperature for 25-30 minutes, until a slight skin forms on top. 4. For the lemon curd, put all the ingredients in a heatproof bowl set over a pan of barely simmering water. Stir for 15-18 minutes, until the curd is thick enough to coat the back of a wooden spoon. Transfer to a clean bowl to cool completely. 5. Bake the macarons for 21-24 minutes, changing the position of the trays on the oven shelves every 7-8 minutes so they cook evenly – watch them as they can brown quickly. Remove and leave to cool on the trays. 6 When both the macarons and curd are cool, whip the cream to soft peaks, then stir in 4 tbsp curd. Place one macaron disc on a plate or cake stand, followed by 1⁄2 the cream mixture, then spread a little more curd on top. Top with another disc, followed by the remaining cream and curd. Top with the final disc and dust with icing sugar.